-1 - 2 capsules once or twice daily with food. If taking two or more capsules daily, you may wish to split the dose between two meals. 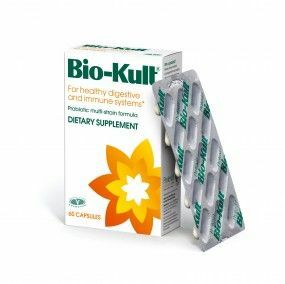 -Bio-Kult probiotic capsules can be pulled apart and the contents sprinkled on to food, mixed in a drink or swallowed whole. Can be stored at room temperature without the need for refrigeration. Total viable count guaranteed to the end of the 2 year shelf life. Store in a cool dry place - no need to refrigerate. Bio-Kult is a completely safe probiotic, has no contraindications and carries no risk of overdose. -Take 4 capsules daily, ideally at a different time of the day from the antibiotics. -2 weeks before travel follow guidelines for general use. -During travel take 4 capsules daily. -Children under 12 - half adult dose. All of our probiotic strains are fully identified and safe to use. The strains are all lodged at the National Collection for Industrial, Marine and Food Bacteria (culture collection bank) based in Aberdeen, UK, where we can ensure the safe reproducibility of the strain without genetic shift. The strains we use are also considered safe by the European Qualified Presumption of Safety Committee.